adidas flagship team, Germany National Team, have launched their new 09/11 home kit, which they will wear for South Africa 2010. Not only that, adidas has also launched limited edition TechFit jerseys: yes, the authentic versions of the shirts the players wear on the field, down to the last detail. We have TechFit versions of most of the adidas federations that launched new kits this past week: Argentina, France, Mexico, Russia, South Africa & Spain. 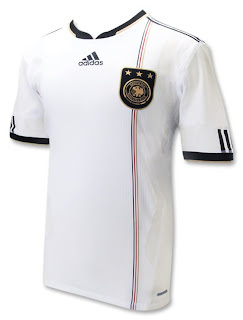 Podolski, Klose, Schweinsteiger & Ballack will look good and be ready to perform in South Africa with this form-fitting authentic shirt: in traditional white, and for the first time featuring three stripes in black, gold and red on the sleeves. The special jersey also includes screened design details and embroidered Germany team badge. Engineered mesh for the ultimate in moisture control and comfort; made of polyester/spandex blend with a seamless construction. Comes in a commemorative box. The adidas Innovation Team has introduced many ground-breaking concepts, and TechFit featuring Powerweb takes performance apparel to a new level. By studying athletes’ muscles and how they move, ait has developed a breakthrough that can be applied to almost any sport. adidas TECHFIT™ PowerWeb is at the cutting edge of athlectic design. Through the use of compression fabrics and applied TPU bands in specific areas, TECHFIT™ Garments give you the ultimate edge whether expoloding out of the blocks, chasing down a shot, or manoeuvring through the defence. TECHFIT™ PowerWeb is designed to focus your muscle’s energy to generate maximum explosive power, acceleration and endurance, so you don’t just perform, you outperform. adidas TECHFIT™ Seamless garments combine the benefit of compression fabrics that stabilize muscles, and seamless-knit construction to ensure maximum comfort so you can concentrate on what you do best. TECHFIT™ Seamless garments are available in 3 levels of compression to suit your needs, and feature CLIMACOOL® and CLIMALITE® technology to keep you cool and dry where it matters. adidas TECHFIT™ Tuned Compression uses the Seamless Melted Yarn technology to achieve the highest level of flexible compression. Melted Yarn zones of high compression are focused on large muscle groups, aiding in the delivery of oxygen and prevention of muscle vibration. Zones around the lungs and joints are designed to be flexible, creating a garment with greater comfort and mobility. Compression is a widely used technology for improving athletic performance; in simplest terms, it involves wrapping muscles in tight-fitting fabric. The base material used in adidas TechFit with Powerweb is Lycra Power®, which offers industry-leading compression benefits. In addition, the ait group uses a combination of silhouettes and mesh inserts that allows for maximum range of motion, breath-ability and comfort. • Enhanced proprioception and body awareness, which means better form and technique. • Reduced muscle vibration, which lessens the wasted energy that comes from muscles that wobble or shake during sport. • Improved muscle recovery, and less wear and tear during workouts. Powerweb is a series of TPU (Thermoplastic Urethane) bands which are pressed onto the base layer of TechFit apparel. There is no other technology like it. The bands are anchored at key points, such as around the waist or above the knees and are focused on key muscle groups (such up upper legs or shoulders). Working in unison with muscles, they function like springs. When an athlete moves, one set of muscles contracts while an opposite set extends; the bands mimic this, stretching on the extension side to store elastic energy. When the process is reversed and the extended muscles contract, the bands snap back to their shorter length, providing an athlete with more power. Compression was introduced by adidas in 1998 in the swimming category. It was used in the first full-body swimsuit, and created a new standard in performance apparel, with athletes including Ian Thorpe swimming to gold wearing it. Since then, many athletes in many different sports have found the benefits of compression. But adidas looked to improve the already proven compression idea, and linking the key muscle groups became the idea to chase. To create a way to do this required some work - from stiffening the existing material by burning it to adding various types of other materials - the ait group soon found TPU (Thermoplastic Urethane). This material provided the elasticity and return stretch needed, with a simple application to fabric that wouldn’t be detrimental to the garment’s fit or comfort. One of the first prototypes of the suit caused a big surprise in 2003, when sprinter Kim Collins became World Champion in the 100 meters in Paris. Since then, the technology materials and applications have been further refined, with the latest developments available at retail in 2007. So, besides the fantastic results of the athletes wearing it, how do we know that TechFit with Powerweb works? Science has shown it. In controlled laboratory tests, conducted together with the University of Calgary, an average 5.3 percent improvement in power output and 1.1 percent faster sprint time was measured over 30 meters. Even more impressive, the testers registered a 1.3 percent reduction in oxygen consumption while wearing TechFit with Powerweb - a clear indication that the onset of fatigue is delayed and that performance is enhanced.